It was on a Christmas visit to Goshen when I saw that the house of the former Front Porch Inn Bed & Breakfast (and then Blackberry Inn) was listed for sale. Over the years, I had often thought about this house, the possibility of running a B & B, and imagined what it might take to make it work. And I recalled spending a retreat day at the Front Porch Inn when Marsha Meyer was the owner and Innkeeper, and remembered how beautiful the house was, and how much Marsha seemed to enjoy Inn operations. With those thoughts, I suggested to Kent that we look at the house as I’d already headed back to Pennsylvania for my work. Kent toured, took friends and family and looked again, and the decision was made. Little did we know how much work this project would be or how long it would take us! Early in the spring of 2015 Kent moved to Goshen to oversee the renovations while I stayed in Pennsylvania. I should say, that Kent started the demolition process rather than renovation! 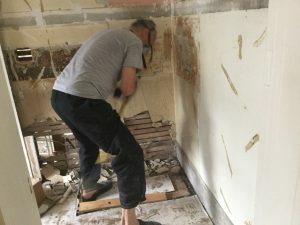 As happens when one renovates an old home, you always find more that needs to be done than what you originally planned. We knew that we would replace all of the HVAC, the plumbing and the electrical wiring, but we ended up installing multiple heating/cooling systems. We have an HVAC system upstairs and one downstairs, and then we added multiple “mini-splits” for several of our personal spaces that were not accessible with the HVAC system. The positive side of this is that we can turn off heat in areas not used, and in the long run these systems will be much more efficient for us (and provide a cost-benefit!) 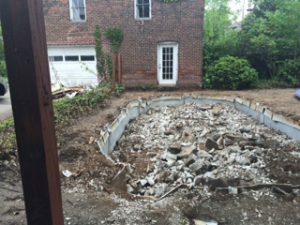 New plumbing and electrical were not negotiable – once we began the renovations, it was clear that starting over was the best way to go. The original kitchen was at the back of the house and was very small. We kept the kitchen cupboards since they were made in Goshen, and we like them, so we made what had been a dining room into the new kitchen. All of the guest bathrooms are new – floors were completely removed and new tiled walk-in showers installed. We also decided to take one of the original guest rooms for our personal master bedroom and turned two upstairs bathrooms into one. 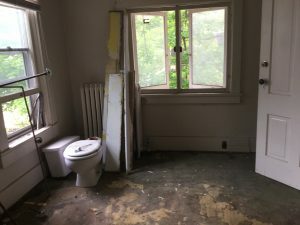 There had been an apartment on the second floor in the back of the house which made for interesting negotiation of the space for our living area. We also opened up the front foyer to expose an original hallway from the front of the house to the back. Since the house had been turned into an apartment building, changes had been made to accommodate apartments and separate living areas. The back yard is still a work very much in progress. We filled in the outdoor pool, laid new ground cover, and started work on flower beds and a small garden. We’re fortunate to have such great neighbors who are accommodating some unique in-between plans until warmer weather allows us to work on the landscaping. We have been blessed to work with a very skilled, trustworthy, and smart people. Our contractor was Zehr Construction/Tim Short. Without Tim, his crew, and their guidance and “can do” attitude, we might have stopped along the way! We are also so fortunate to have a good friend and family member, Cynthia Brubaker, a professional preservation developer, work with us on this project too. Cindy has guided us on designs, kitchen layout, and many other decisions that preserve and enhance the historic value of this home. There are many more details that can be shared, but we hope that you’ll come and visit – stay with us!